How Much Does the 2018 Chrysler Pacifica Cost? How Many MPG Does the 2018 Chrysler Pacifica Get? What’s New for the 2018 Chrysler Pacifica? From its sleek exterior to its luxurious interior design, the 2018 Chrysler Pacifica is a technologically advanced minivan that any auto shopper would be proud to own. If you’re looking for a family van that features quick acceleration, easy handling, and plenty of high tech-features, look no further than the 2018 Pacifica. For this model year, the hybrid model gains the Touring Plus trim, while an L trim level is added to the gasoline engine line. New equipment includes ParkSense rear-park assist, blind-spot monitoring and rear cross-traffic alert. The Pacifica also gains some convenient standard tech features such as Apple CarPlay and Android Auto. Under the hood, the 2018 Chrysler Pacifica is equipped with a 3.6-liter V6 engine that puts out 287 horsepower and 262 lb-ft of torque. It gets an EPA estimated 18 city and 28 highway miles per gallon. The V6 is paired with a 9-speed automatic transmission that sends power to the front wheels. For a more fuel-efficient ride, choose the 3.6-liter V6 engine paired with dual-electric motors and 16 kWh battery. It provides a combined 260 total horsepower, an EPA estimated 32 mpg/84 MPGe and can drive up to 33 miles on a battery-only range. Step inside the 2018 Chrysler Pacifica, and you will be treated to luxury. This popular van features comfortable second and third-row seats and features Stow n’Go second row seats. Total cargo volume is a respectable 140.5 cubic feet. When you choose the Pacific LX, you will be treated to a standard rearview camera, 3-zone climate control, blind-spot monitoring, parking sensors, and rear cross-traffic alert. Stow n’ Go seating and active noise cancellation, USB ports, Uconnect infotainment system, Apple CarPlay; and Android Auto; are all standard in the LX. All 2018 Chrysler Pacifica also include an electronic parking brake, keyless entry, and push-button start. Notable optional equipment includes Nappa leather seating, chrome exterior trim, 20-speaker Harman/Kardon audio system, Advanced SafetyTec system which includes a lane-departure warning, forward-collision warning plus, adaptive cruise control and surround-view camera system, as well as a Uconnect Theater system. You can drive with confidence thanks to Pacifica’s 5-star overall crash test safety rating from the National Highway Traffic Safety Administration. 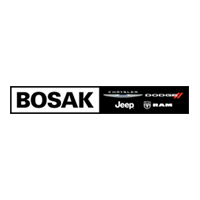 Visit Bosak Chrysler Dodge Jeep Ram to take any available model for a test drive. Our friendly and professional sales staff will guide you throughout the financing or leasing process and answer any questions you may have along the way. They will also help you compare trim levels and provide you with a list of optional features to ensure that you drive off of our lot with the vehicle that suits your driving needs and lifestyle best.